Our Hospitality Desk will be located in the hotel for your convenience between 2:00 p.m. and 7:00 p.m. It is here that our friendly staff can assist with everything from general questions about your upcoming voyage to reserving Premium Shore Excursions. An American Queen Steamboat Company representative, as well as a local representative, will be readily available to provide you with dining, entertainment, and sight-seeing suggestions so that you may maximize your time in New Orleans. Magic is in the air at Nottoway Plantation as the melodies of Christmas echo through the halls of the great mansion and carry across the lush grounds. Your evening at Nottoway Plantation is full of enchanted holiday traditions including festive Christmas Markets offering a glimpse into holidays past, a traditional Southern Ball performance, and an exclusive Holiday Gala where you can enjoy cocktails, indulge in decadent desserts and dance the night away. This romantic evening is capped off with the lighting of traditional bonfires along the levees. Established in 1809, St. Francisville is the oldest town in the Florida Parishes. Today, St. Francisville retains its historical, small-town charm and their festive holiday celebrations are no exception. Stroll through the streets of St. Francisville, adorned for the season as jolly carolers stroll along the bustling sidewalks. The streets come alive with holiday charm as yuletide music fills the air. Stop in at the St. Francisville visitor’s center for a warm welcome to this southern gem. This charming river town was first inhabited by Natchez Indians and French explorers who shared the land. It was founded in 1716, making it the oldest city on the Mississippi. The city is known for its elegance, hospitality, and impressive preservation of history – found on every street corner throughout Natchez. Guests will enjoy the unique shops, restaurants, museums, and historical houses located in Natchez, as they explore the beautiful downtown areas. Enjoy Memphis at your leisure or consider a Post-Cruise Premium Shore Excursion with airport transfer. Surrounded by wonderful period details and with every modern convenience, you will find your cares disappear within moments upon entering these cozy havens. Ample shelving and storage spaces keep your necessities out of the way but easily accessible. An expansive bay window overlooking the ever-changing scenery of America’s heartland is the main draw of this spacious category. Curl up in front of the window with a new novel and savor a moment that belongs to only you. With your own private veranda, these staterooms are so enjoyable you might decide to extend your journey. Sit in your cozy armchairs and prop your feet up on the ottoman as you read through the River Times, our daily program, and discover the delights that await you. 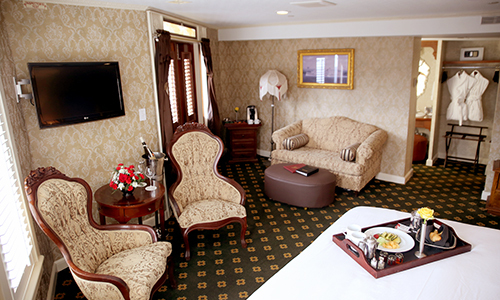 Our suites give you the feeling of a fine Southern estate home, complete with authentic Antebellum décor and antiques. Indulge in a soothing soak in your tub and then retire to your cozy armchair, prop your feet up on the ottoman and read through the River Times, our daily program, to discover the delights that await you. As a guest of this fine suite, you will also receive the benefits of exclusive suite-level Commodore Services. Our spacious, elegant suites are furnished with authentic Antebellum décor and fabulous antiques providing the warm ambiance of a fine Southern estate home. Open your French doors and delight in sweeping river views as you sip a beverage and share conversation in your cozy sitting area. With two configurations to choose from, either one large room suite with private veranda or two adjoining rooms with open veranda, these intimate suites accommodate a variety of travel needs and are the ideal choice for family and friends vacationing together. As a guest of our luxury suite, you will also be treated to exclusive suite-level Commodore Services, as well as personal river butler service.